(NEW ALBANY, Ind. )–In a first-of-its-kind for research, printmaking student and IT support staffer Kathryn Combs is using eye-tracking software to examine how audiences look at art, and to produce works that span the gulf between art and technology. And it all started with deodorant. Two years ago, as Combs strolled through a local mall, she was invited to take a survey for a market research firm. The in-kiosk quiz used eye-tracking software to gather information on where Combs’ attention was focused when she looked at an image featuring a shelf of different deodorants. The data provided by her darts and stares would be used to sharpen the effectiveness of promotional graphics for the firm’s client. Combs, ever the artist, immediately saw the potential for creative work with a less mercenary purpose: to create works of art that would incorporate the reaction of the viewer. Working with Susanna Crum, assistant professor of art in printmaking, Combs submitted a proposal for the project, Looking Longer, that was awarded a student summer research fellowship this last summer. The project essentially recreated Combs’ mall experience, with a few significant twists, and a deeper import. Where marketers use eye-tracking and mouse-tracking to gain data that allows them to analyze and optimize advertising, Combs’ project sought to create images that encourage viewers to reflect on the way they look at art. To Combs’ knowledge, it’s the first such application of eye-tracking technology of its kind. 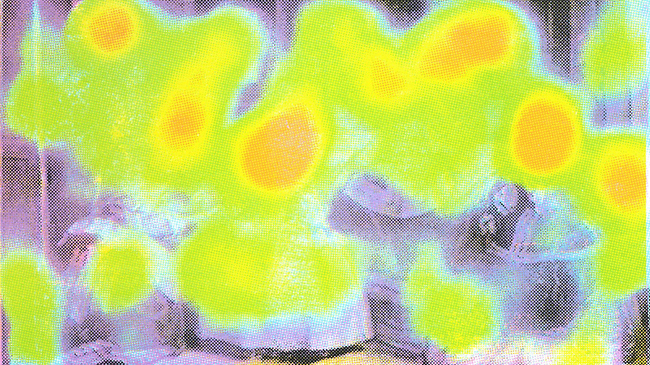 Having needs that were not met by readily available software, Combs downloaded two freeware programs—GazePointer and Fake Heatmap Generator—and molded them into a tool that would enable her computer to capture and track eye movement and translate it into heat maps at a resolution sufficient for printing. To do that, Combs relied on her IT skills and work ethic, spending time researching and acquiring the knowledge that would enable her to overcome the limitations of each program. This combination of artistic sensibilities and tekkie chops has been a theme in Combs’ life since she can remember. Her grandfather repaired and built PCs as a hobby, her mother painted while working as a help forum moderator. Combs great up liking both worlds, and sees them as related. She found this harmony respected at IU Southeast, where she took inspiration from the words of former Design Center director, Jonathan Ruth, who encouraged her to see both technology and art as problem-solving. “If you’ve learned to problem solve creatively, you’re always looking for ways to fix or communicate something,” Combs said. Armed with the right technology, Combs moved on to the art. The next step was to select images that were in the public domain (free) and visually compelling. Combs knew from her research that portraits would yield almost identical heat maps, as the viewer’s gaze inevitably seeks out that of the subject. So she selected images with varied subject matter and more diffuse centers of interest, from diverse cultures and featuring a range of colors: a self-portrait by Van Gogh, a waterfall by Hokusai, a landscape by Rivera, a flower by Redon, and more. Combs intentionally drew from the creative commons, both to save money and more importantly, to respect the rights of fellow artists. As they scanned the art, the computer tracked their gaze. The software created a heat map from their eye movements, showing where they had looked, and for how long. Combs then printed a selection of the most striking images via silk-screen. The choice of printing medium was not automatic. Initially Combs considered large digital prints, but decided on screen printing, as it aligned more closely with the philosophical purpose of the project. Combs selected a group of prints, named them after the corresponding “test subject,” and presented the results in a gallery show at the SpaceLab. The heat maps have a beauty all their own, inhabiting a realm reminiscent of ultrasounds or x-rays, a revealing of mind through attending. And this is the counter-intuitive conceit of the project, since art is generally perceived to be an active agent that comes smashing into a passive observer. In Combs’ project, the roles are reversed. Viewing is active. The final products, the two-dimensional screen-prints, are more than a documentation of viewing habits. They are recordings of a dialogue without words. This is art taking place over time. So although this is two-dimensional print, it shares that living quality with music and theater. Michelle Clements, program analyst in the Office of the Registrar and a longtime friend of Combs, was invited to participate in the project. Technically inclined, she was drawn in by the concept, then impressed by Combs’ masterful command of every aspect of the process, from managing the viewings to providing refreshments and activities for the waiting participants. 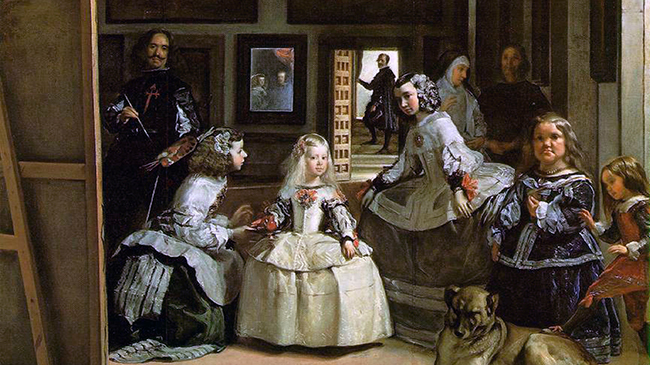 It turned out that one of the paintings Clements viewed was “La Meninas” by the Spanish Baroque master Velasquez. True to the intent of the experiment, the viewing unlocked different levels of experience for Clements. A detail of “Las Meninas” by Diego Rivera de Silva y Velasquez. While the project is unique as a way to deepen the experience of viewing art, and pathbreaking in its use of eye-tracking technology, it has also delivered results that validate traditional theories of art, demonstrating the attraction of viewers to the human face and warmer colors, for example, and showing how composition works to manipulate and channel a viewer’s gaze, essentially leading them through the “story” of the painting. In many ways, Combs’ project displays in microcosm the same thoroughness and professionalism that marks her approach to art as a career. On the level of her creative work, she has taken to print in part because of its almost need for almost obsessively detailed planning. But she has also zoomed outward to initiate print exchanges with other artists from around the country, a networking venture that supplements her efforts on social media forums and in person at local exhibitions, as well as print conferences as close as last year’s event at IU Southeast and as far away as Atlanta, Ga.
For an artist like Combs, thinking outside the box is a survival skill.